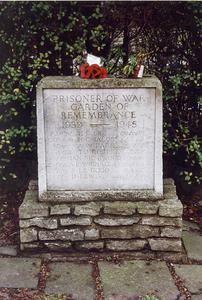 Located in the Garden of Remembrance by the Mutton Lane Cemetery. Stone tablet inscribed with plantin lettering atop a base formed from individual slabs of stones stacked together. Shortly after the memorial's dedication on 5 September 1948 the memorial was vandalised. The memorial was disfigured with yellow paint, partly obliterating the names; the perpetrators were never found. The stone was removed for cleaning and possibly re-dressed. Comments: Land for the memorial was provided by St Mary's Parochial Church Council. Details: The Potters Bar and Little Heath Prisoners'-of-Wars Fund, begun in 1940 by Cllr. Mrs. Kathleen Maude Gregory.